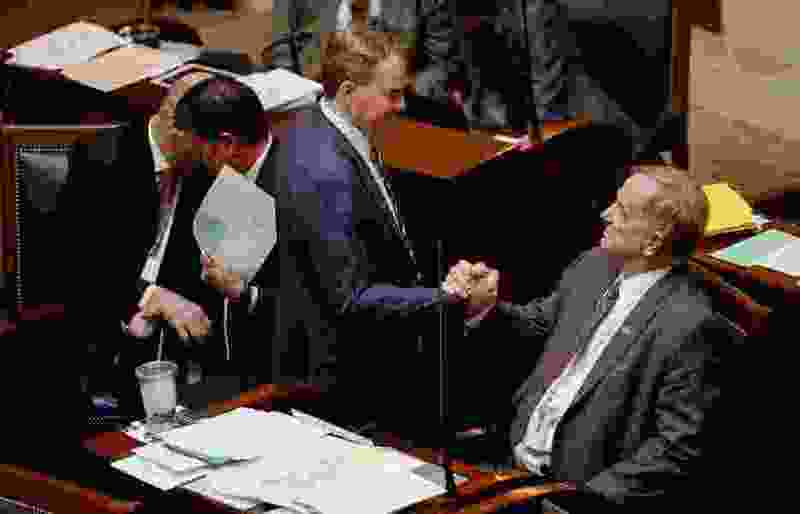 (Francisco Kjolseth | The Salt Lake Tribune) Sen. Allen Christensen, R-Ogden, right, sponsor of SB96, the replacement plan for the voter-approved full Medicaid expansion, is congratulated following debate on the floor as the Senate gave final approval to replacement plan on Monday, Feb. 4, 2019. Utah Senators voted 22-7 on Monday for SB96, sending to the House a replacement Medicaid expansion plan that initially costs considerably more money to cover fewer people than the voter-approved Proposition 3, and which would automatically repeal itself if the state fails to receive funding waivers from the federal government. The Senate on Friday delayed its final vote on SB96 while awaiting a new version of the bill and a cost estimate from fiscal analysts. Both the new bill and analysis were released over the weekend, showing that SB96 would cost $72 million over the next two years, compared with an estimated $10.4 million budget shortfall for Proposition 3 by 2021. Those estimates were updated shortly before debate with new numbers suggesting a two-year cost of $49 million for SB96, or five times greater than Prop 3. But Senate leaders and the bill’s sponsor, North Ogden Republican Sen. Allen Christensen, continued to cite the $72 million figure during Senate debate and in conversations with the media after the vote. Senate leaders last week acknowledged that their plan would initially be more expensive to implement than Proposition 3. But those costs would ultimately drop, they argued, once the federal government signs off on the state’s changes and agrees to pay 90 percent of Utah’s Medicaid costs. But if that request is denied — no other state has received such a waiver — then a provision in SB96 would automatically repeal Medicaid expansion in the state. “That means we’re back to ground zero without any expansion,” Christensen said. Christensen has stated that Utah’s waiver is all-but-guaranteed, but Senate Majority Whip Dan Hemmert, R-Orem, said Monday that the auto-repeal language is necessary to put pressure on federal administrators at the Centers for Medicare and Medicaid Services, or CMS. “That provision is what gives CMS the motivation to work with us in getting the waiver granted,” Hemmert said. Monday’s Senate vote was an effective repeat of a preliminary vote held last week. The bill passed largely along party lines, with only Sen. Todd Weiler, R-Woods Cross, breaking rank with his party to oppose SB96. The chamber’s Democratic minority was vocally opposed, with all six members airing their objections to replacing Prop 3 with a more restrictive proposal that imposes work requirements and enrollment caps on beneficiaries. Republican senators argued that despite majority approval by voters, Proposition 3 does not pay for itself over time and must be contained to protect the state’s budget. “A majority of voters cannot overrule the laws of mathematics,” said Sen. Lincoln Fillmore, R-South Jordan. Compared with Proposition 3, which allows Utahns earning up to 138 percent of the federal poverty level to enroll in Medicaid, SB96 covers only individuals earning up to 100 percent of the poverty level. The remaining expansion population would be left to purchase subsidized insurance through the Affordable Care Act individual market. Because the Senate plan only partially expands Medicaid, the federal government would initially pay 70 percent of the state’s cost, compared with 90 percent under Prop 3. SB96 seeks to launch a “bridge” expansion program on April 1, with the state paying 30 percent of Medicaid costs for up to 18 months, or until the federal government agrees to a 90-10 match for the smaller expansion population. The bill will now move for consideration to the Utah House, where leaders are similarly supportive of replacing Prop 3. But at least one member of the House majority, Bountiful Republican Rep. Ray Ward, believes that Proposition 3 can be implemented responsibly with only minor changes. He has sponsored legislation that would create a dedicated budget reserve to fund the ongoing costs of the expansion, supported by a combination of sales tax revenue, Medicaid cost savings and a potential tax assessment on hospitals that was part of a Medicaid bill approved by lawmakers last year. Ward’s bill, HB210, is currently being held by the House Rules Committee, which must vote to release it to a committee in order for regular debate to begin. Ward said it’s unlikely to be assigned to a committee unless SB96 fails in the House. Matt Slonaker, executive director of the Utah Health Policy Project, said the Legislature’s apparent refusal to consider less dramatic amendments like HB210 suggests implementing Prop 3 is not their goal. Instead, he said, senators are using SB96 as a vehicle to pursue an expansion plan well outside the spirit of what voters approved in November. And while the individual marketplace has improved access to health care for many people, Slonaker said, it’s a difficult system to navigate for low-income Utahns, many of whom lack English language fluency, or are dealing with substance abuse, mental-health symptoms and other hurdles. Legislative leaders have acted quickly on SB96, citing the need to have a replacement Medicaid expansion program on the books in order to begin the application process for a federal waiver. That debate has coincided with a rally by roughly 300 supporters of Proposition 3 on the first day of the legislative session, a letter opposing SB96 signed by 40 faith and community leaders, and the launch of television ads over the weekend criticizing lawmakers for the effort to repeal a voter-approved initiative. Andrew Roberts, a spokesman for Utah Decides — which sponsored Prop 3 — said the Senate had voted to throw the baby out with the bathwater. Utah allows for votes of the Legislature to be overturned by referendum, but only if a bill falls short of a veto-proof two-thirds majority in the House and Senate.